Something weird is happening in the deep reaches of space. Canadian astronomers recently detected a repeating radio signal is the cosmos again, and they’re not sure what it’s coming from. Are aliens trying to make contact with us? Your guess is as good as ours. The new radio signal, known to scientists as a fast radio burst (FRB), repeated six times and appeared to be originating from about 1.5 billion light years away, according to a study from Nature. The burst has been named FRB 180814 by scientists with the Canadian Hydrogen Intensity Mapping Experiment (CHIME), in conjunction with the FRB Collaboration. Scientists believe the signal is coming from about 1.5 billion light years away. It’s one of many FRBs discovered since 2002, but only the second one that has repeated. Typically, FRBs are one-off occurrences. The first repeating signal was discovered about three years ago, in 2016. That signal, named FRB 121102 (catchy, right? ), repeated 10 times and was eventually tracked to a small galaxy three billion light years away -- nearly twice as far as the latest repeat signal’s origin. The same FRB sent 15 more radio bursts in 2017, which told scientists it was more than a one-time space explosion. The latest repeat FRB signal and the one astronomers discovered in 2016 have a few things in common. According to the study, the two signals have “similar emission mechanisms and/or propagation effects,” whatever that means. Scientists believe the latest FRB is part of a “substantial population of repeating FRBs” because it was found with little effort. When CHIME scientists picked up the signal, their system was operating at a fraction of its full capability. Several of the new FRBs were detected at just 400 megahertz -- the lowest radio frequencies measured to date. Other similarities, according to Andrew Siemion, who works as an astrophysicist and director of Berkley’s SETI Research Center, include “very limited spectral extent and drifting emission.” He’s hopeful that scientists will be able to gather more information on the latest repeater in the coming months, he told Newsweek. Why can’t scientists figure these things out? The trouble with FRBs is they last only a few milliseconds and originate in galaxies far, far away, traveling through space for billions of years. As a result, they’re often only discovered in reviews of data long after the signals are sent out, at least that used to be the case. Tracking their origins can be difficult, to say the least. Scientists have some thoughts about FRBs, but nothing conclusive. 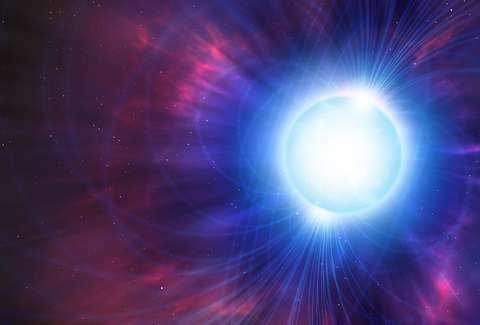 Some believe FRBs are the result of neutron stars with bulked up magnetic fields, known to the science-savvy among us as magnetars, rapidly spinning. Other theories include highly dense space objects merging, stars collapsing, enormous black holes, and even alien civilizations. Admittedly, the latter is a less likely (though exponentially more exciting) explanation. CHIME scientists are hopeful they’ll be able to get to the bottom of all this in the coming months. We’re crossing our fingers for the aliens theory, but definitely don’t hold your breath.